JulieKQuilts: Giveaway! coming and going!! I have been off today, and have not done one stitch of sewing!! What is the world coming to? I have been busy catching up on the house cleaning, laundry, and other necessary things. While straightening, I found that I have two of this book. I would love to give this one away to a random person...so please leave me a comment and I will have a winner next week. Em! of Em's Scrapbag. Please see her blog HERE! Em was kind enough to give away 10 of these pretty flour sacks, and the contest is to create a quilt around the flour sack. This flour sack happens to come from a small Colorado town quite close to where I grew up. Thank you, Em...I am on it!!! Please see her blog, and her badge on my blog. I am kinda old...so when I went to nursing school, I was actually taught this phrase. My nursing student had no idea what I was talking about when I said it yesterday, so I guess it is no longer taught? It really means that every patient you come in contact gets treated the very same...universally!! Positive thoughts for everyone! Drug addicts, wife beaters, alcoholics, nuns, priests, housewives, business executives, movie stars (and yes, I have had a couple)...every one the same. I really try to do this...and have found that almost every single person has some redeeming quality, if I take time to find it. Consequently, I am frequently given the "challenging" patients, if you know what I mean, nurses out there. I was just musing about this yesterday at work...what do you think about this, nurses and quilters? I really, really try to do this...the only time it is hard is when the patient is abusive to me...then I try harder, harder, harder!!! How do you deal with this, nurses? YES...I'd love a chance to win that lovely book...thanks for the chance...am I the first to comment!!! I would love to win the book, Julie. That is one I have pondered, but never purchased. Just saw the little bluebird bag on another blog this morning. I can't wait to see what each of you do with it. I think it is such a fun idea. My appreciation for nurses just keeps growing, as lately I seem to constantly have family members in need of medical attention. This week it is my brother (just 2 years my senior) hospitalized Monday after a mild stroke and having an angiogram today to check for blockage, due to previous heart issues. We have had wonderful nurses over the past few months and I am grateful there are nurses like you out there. I Love the "Universal Positive Regard" phrase. Should definitely still be taught!! May be the only positive regard some people get! Thanks for the chance! I would love to win the book. uoooo....when I find I have more then one of a book it means there must be something there I like a lot! I am afraid of how many extra copies I may have lurking in the to be straightened book closet. I have done this with fabrics too!! Hey, I'm a random person. I'd love to win that book. Thanks for the chance. Hi Julie. Thank you for the chance to win this book. I really like your blog, not only for the beautiful quilts that you make, but for the wonderful stories you tell about your patients. I would love to win your extra copy. Thanks for the giveaway. I tried really hard to use that philosophy when I was teaching high school language arts, too. Every student treated the same - no favorites. The practice was noticed by the students, believe me. I'd love the opportunity to win the book. Thanks. I too, would love to have a chance at the book - like I need another project - but hey - don't we all love to dream!! You know, not just nurses should do this - the ole "Golden Rule" should apply to everyone ALL the time! I find that sometimes I have two books alike and I delight in sharing with other quilters. I do NOT have this book, so thanks for the chance to add it to my collection!!!!! Can't get much more random than me:) The quilt on the cover looks to be just my style. I vote that "Universal Positive Regard" is taught to everyone--not just to nurses. I very much enjoy reading your blog and drooling over the beautiful quilts you make. That is a book I don't have. About the universal part, we should all try to do that with everyone we come across. Yes, please! :) I would love to have my very own copy of Nickel Quilts. Thanks for the chance to win. Thanks for the chance at the book! 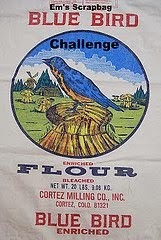 And that is a sweet blue bird on that flour sack.....I can't wait to see what you do with it! I have that book so good luck to everyone. My guy is like you, he wakes up wondering how he can make someone's day better, every single day! It never leaves his mind. I have Pat Speths' second book but would love to own the first book as well. I love scrap quilts so winning that book would be right up my alley. Thanks for a chance. Would love to make some of the quilts in that book! Universal Positive Regard... love it! I think you have to find what makes each nasty creature "tick"... what they respond to. Sometimes it's humour, sometimes extra TLC and attention, sometimes they do well with someone who is stands up to them and doesn't back down, and sometimes they only respond to the person who has the most power. This looks like a great book for making scrappy quilts. Please add my name to the drawing! I enjoy reading your nurse notes. You seem very sweet and compassionate. We encounter different nurses during his chemo days and most are super but every now and then we get the one who obviously just going through the motions. Of course I'd love the book...please put my name in. Hope I get picked. Love the quilt on the cover. Thanks for the chance. I am not nursing now but I am volunteering at a hospital where they stress to us volunteers that everyone gets treated the same.....black, white, old, young, rich and poor. We have contests to see who can make the patients experience the most remarkable hospital stay they ever had. I love the attitude and the kindness this spreads. Everyone is to be met with a smile and asked how we can help their day get better, visitors as well as patients. Most people are touched just to be asked and say thank you, but many have little problems we really can help them with. I try to teach young people that every person has a story, a life, that has shaped them, respect everyone the same, and be grateful you don't have to walk in their shoes. Okay I am sound preachy now but honestly I do hope you can get the younger nurses to see that just because you are well off doesn't make you any more valuable in the eyes of God. I appreciate your thoughts and what you do for others. Thanks for a chance to win a fun book! "Universal positive regard" is a new phrase to me (even though I'm kind of old, too) but it is not a new concept. It is sometimes a challenge but as you said, it helps to just keep trying harder and harder. Thank you for offering the book. I would love to give it a home. I love reading your blog and seeing all of your wonderful quilts! I would love to win this book. I have been lurking on your blog for a number of years now. I would love to win your extra book! So I thought I would jump out of lurkdom. I am an old school nurse as well. I work in Paliative Care and a small Hospice. I agree with you. Every person deserves to be treated with respect and dignity. Every human being is equal and deserves our very best care. I enjoy reading your nurses notes! I have been off work for a couple of years now - as a patient! And I have had the most amazing and hard working and compassionate nurses! Interesting to be on the other side of that bed! I have seen this book but never got it. I would love to win your extra copy. Please count me in on the book give away! I borrowed this from the library and "almost" forgot to take it back. :) I love the quilts in it! Yesterday some #$%# jerk parked at an angle so close to me I could barely back out of my parking space. I was so angry! As I slowly and carefully inched out, a young man was slowly walking toward the ill parked car. We caught eyes - I rolled down my window. He said "I'm sorry, I parked way too close to you." I nodded then he said "I've had a really bad day... " and all the anger melted out of me. I guess I felt universal positive regard for this poor guy, as his bad day was clearly much worse than my inconvenience. Thanks for the reality check. Your posts are always thought provoking. Oh yea, your quilts are great, too!! Nice post, thinking out load is OK.
Nice giveaway, but don't count me, not because I don't like the book, but because I have been lucky at winning on your blog before, i won the wool felt bundle a couple of years ago. I would love to win the book! I have a son who is an RN and he has had some abusive patients, but I think he handles them quite well (from his side of the story anyway)! People certainly aren't at their best while sick and in the hospital. I enjoy reading your thoughts about nursing. Haven't read this one, thanks for sharing. It is sad if nursing students are no longer taught that phrase/philosophy of nursing. Bless you for having such a kind attitude toward all who are in your care, my friend! Oh! I would love to win your book too. I have so many scraps and have been trying to use them up~ a new to me book is always a great incentive. I love the bird flour sack~ I'm sure you will come up with a great idea for it! Have a great weekend~ and thanks for the chance! Thanks for the chance to win the Nickel book--looks fabulous!! It would be lovely to win! On another tack, I have a daughter-in-law who works in Cardiac ICU and because her hospital is where it is, she frequently gets the "difficult" patients. Lord, you nurses need patience! Bless you for trying to be universally positive! Love your blog and always enjoy your nurse's notes! And I sure love your quilty projects! 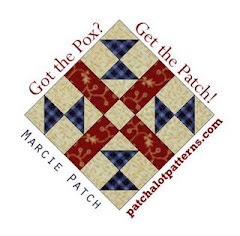 I would love a chance at the Nickel Quilt book. I would like to say thank you for being a nurse. If you combined all the times I have been in the hospital it would be at least 15 out of 61 years and I am always so grateful for the nurses. You are the ones who know what's going on with the patients, who take care of us, put up with us, reassure us and relay our condition to the doctors. Sometimes you even help us break the rules when it won't hurt us. ( Telling us where to send the pizza delivery guy at 11:00 at night to meet you so we could quell a late night craving.) As far as I'm concerned the nurses are the heart and soul of the hospital. I have the first Nickel Quilt book and always planned to get another one. But haven't. So I'd enjoy this one should I be the lucky winner. Thank you for sharing a book and for your interesting blog. Quess I could start something like yours...! And ofcourse I also would love to join your Giveaway about the book Nickel Quilts; it's a book I came across several times and never got around buying it...... So hope to get lucky!! Love the giveaway. Want to come do my housework too? You sound like such a wonderful nurse. I wish they were all of that attitude of yours. I'd love a chance to win your duplicate book! I know I don't have it. Thank you for sharing your extra book!!! A Chance to Win a Quilting Book you say? I'm in! I would be thrilled to win a Book on Nickel Quilts. Think you must have the patience of a saint! Hope you don't get challenged too often!